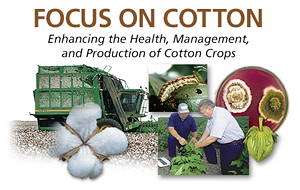 Each year, Cotton Incorporated sponsors more than 400 research projects with universities, USDA and private cooperators across the United States. The majority of these projects are aimed at improving production efficiency and profitability. Not only is Cotton Incorporated sponsoring projects, but there is also a significant amount of agricultural research sponsored by state universities and federal agencies. Cotton Incorporated’s Agriculture and Environmental Research Department has developed the Cotton Cultivated website to help users find cotton specific information as quickly and easily as possible. This new site provides a portal that integrates websites, downloadable documents, social media and real-time news feeds that have been “cultivated” in an effort to reduce the time spent sorting through pages of irrelevant search results. Cotton News displays recent cotton related stories from agricultural media sources as well as current cotton market reports (fiber and seed), and the latest crop quality report summarized by Cotton Incorporated. Cotton Multimedia provides current weather conditions along with access to the latest Focus on Cotton Webcasts and a video library featuring short tutorial videos on various aspects of cotton production. Research & Reports displays the latest information uploaded to the site. Materials in this section are downloadable directly from the website. The buttons in this widget allow flipping through the three most recent research reports added. To browse all of the material available, simply click on “See all Research and Reports.” Once all the material is displayed, there is an option to filter by growing region and topic. The Resources Directory works just like the Research & Reports widget but provides a preview of the most recently added web resources. Materials in this section are trusted resources that are useful across the spectrum of the cotton growing community. All of the resources in the directory link to an outside website. In addition to the four primary widgets, there is a Cultivated Twitter feed which follows cotton related media, research and extension experts. The tweets can be filtered by region and provide real time information without the need for a Twitter account. We welcome your feedback on how to improve this site and want to hear about features you would like to see added in the future. Please use the “Contact Us” link at the bottom of the webpage to send a message.